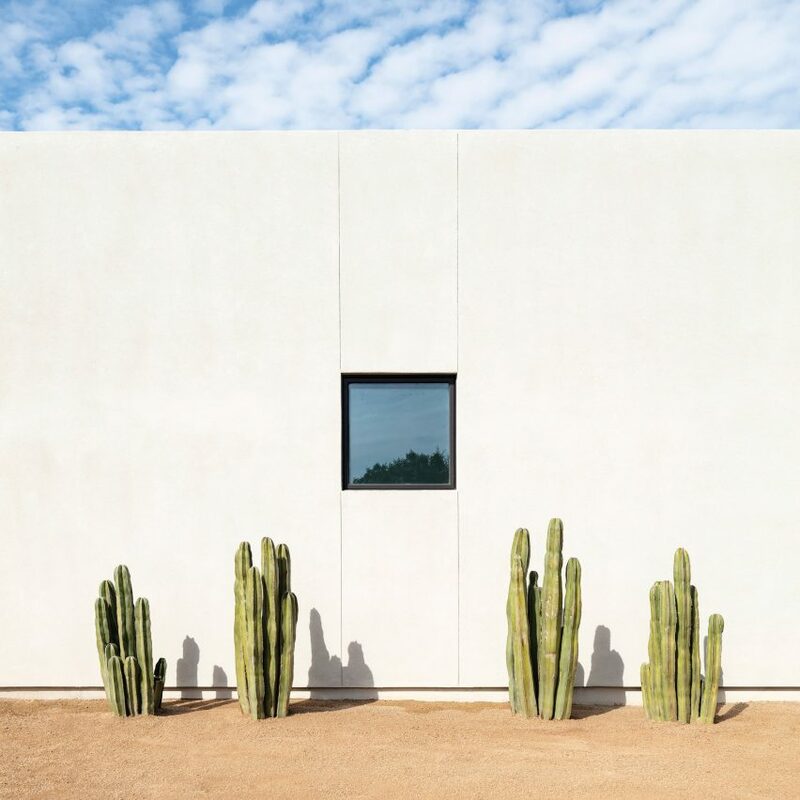 American studio The Ranch Mine has completed a modern courtyard home in Arizona that alludes to Georgia O’Keeffe paintings and prioritises “simple materials, distinctive geometries and the desert sky”. 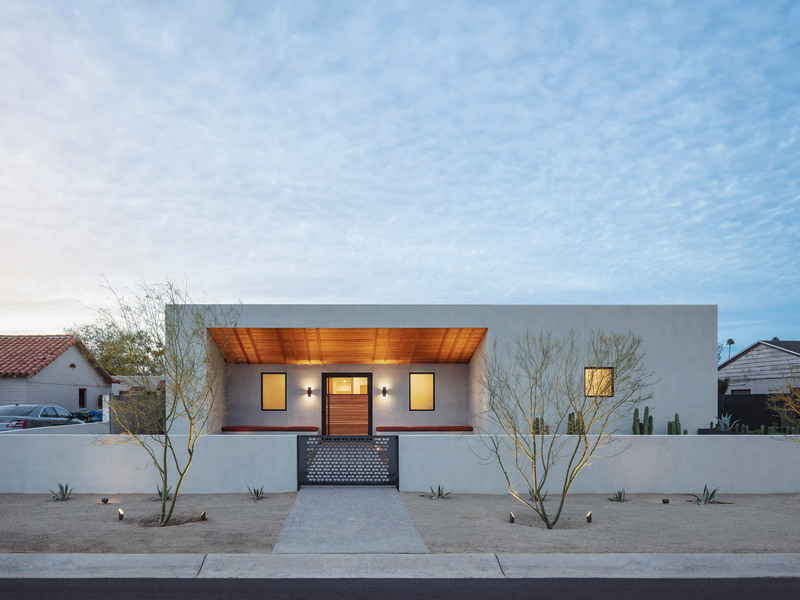 Located in Uptown Phoenix, the Weave house was built atop a former parking lot in a historic district. The project’s name stems from the weaving together of modern amenities with a vernacular distinct to the American Southwest. While designing the project, local studio The Ranch Mine turned to paintings of adobe buildings by Georgia O’Keeffe – the famed artist who also lived and worked in an adobe home in New Mexico. 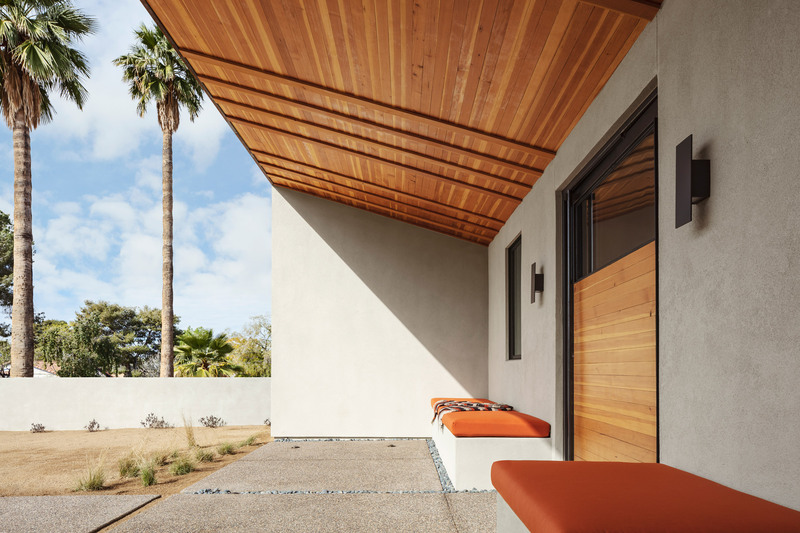 “Like Georgia O’Keeffe’s work, Weave is derived from a focus on line, colour and composition, creating a modern home with simple materials, distinctive geometries and the desert sky in an effort to reinvigorate the residential architecture of the American Southwest,” the studio said in a project statement. U-shaped in plan, the wood-framed home consists of rectilinear volumes organised around a central courtyard. 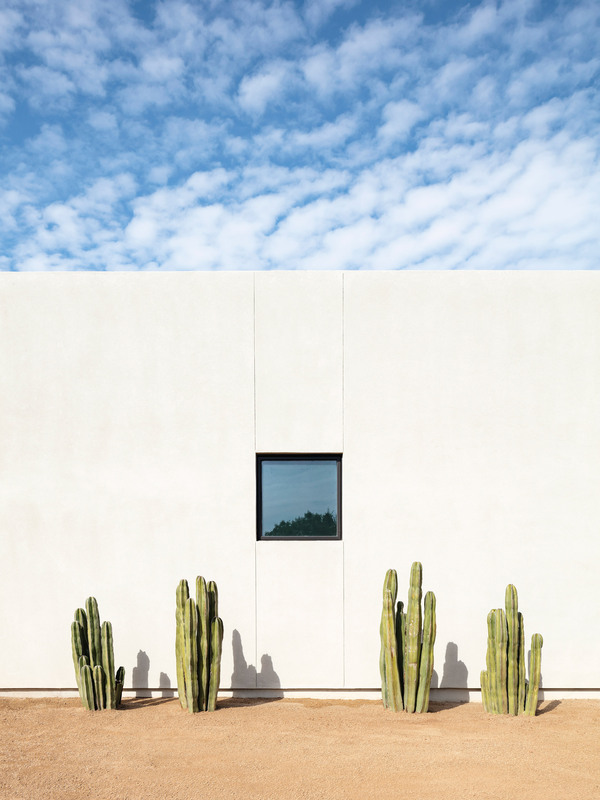 The facades of the single-storey dwelling are sheathed in cream-toned stucco, helping reflect the intense desert sun. Windows and doors are framed in black metal. From the street, the home is meant to look unfussy, with emphasis placed on the vast blue sky surrounding it. “The front elevation is simple in its massing and materials, letting the sky and shadows provide constantly changing visual interest,” The Ranch Mine added. To access the home, one passes through a low-lying, perforated metal gate and enters a front yard with climate-sensitive landscaping. This outdoor space “softens the transition from the street with a series of desert plantings, stucco walls and a steel planter”. The front door is set within a shaded, recessed area featuring traditional-style benches, known as “bancos”. 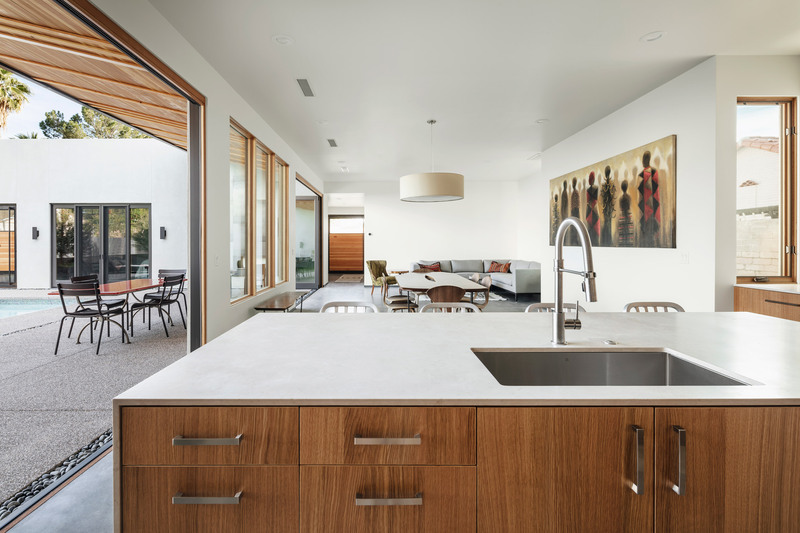 Overhead, a large woven soffit is made of Douglas fir sourced from the homeowner’s own lumber mill. This attention-grabbing element takes cues from viga-and-latilla ceilings – a classic element in adobe buildings. Latillas are boards or peeled branches that are laid between structural wooden beams, or vigas. 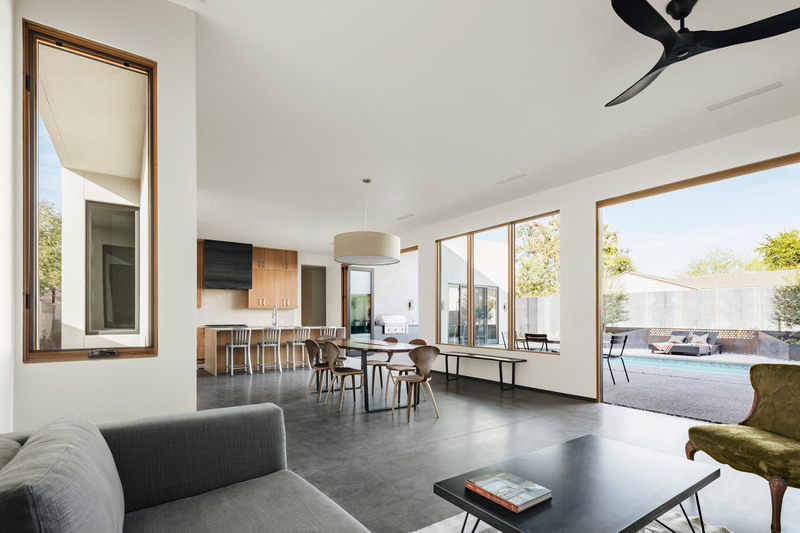 Encompassing 2,543 square feet (236 square metres), the residence features a fluid layout and bright rooms with concrete flooring and wooden accents. The public zone encompasses an open-plan kitchen, dining area and living room. 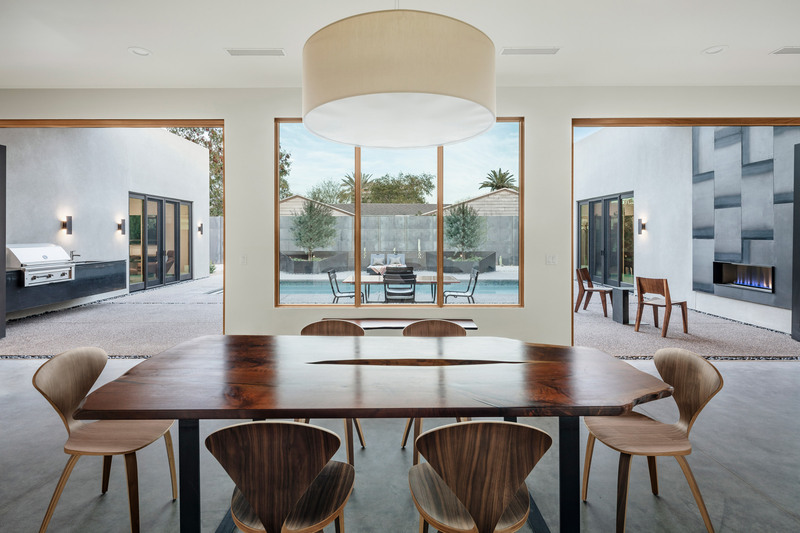 Operable windows facilitate natural ventilation and bring in diffused daylight, while bi-folding glass doors provide a smooth connection to the central courtyard. The team used a neutral colour palette and earthy finishes throughout the dwelling, including white oak cabinetry and honed-marble countertops. 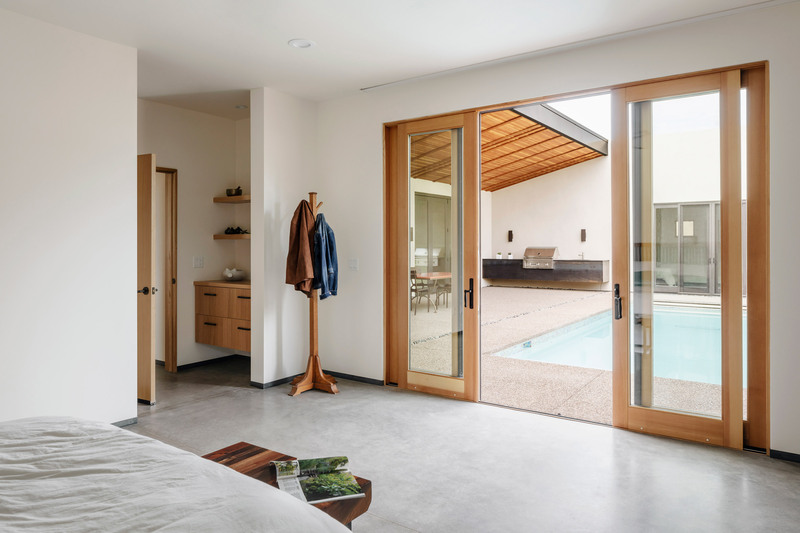 In the master bathroom, a copper soaking tub was placed next to a large, pivoting door – transforming the private area into “an outdoor experience”. Concealed from the street, the central courtyard provides the homeowners with a private space for enjoying the outdoors. Rather than put a traditional fountain in the space, the team installed a swimming pool. The water helps cool the air while also adding humidity – both important considerations in the desert. The courtyard is partly shaded by a canopy that resembles the latilla-type ceiling in the front of the home. The generous outdoor space also features a wall-hung kitchen, various seating options and a steel-clad fireplace for staying warm on cold nights. Founded in 2010, The Ranch Mine is led by the husband-and-wife team of Cavin and Claire Costello. 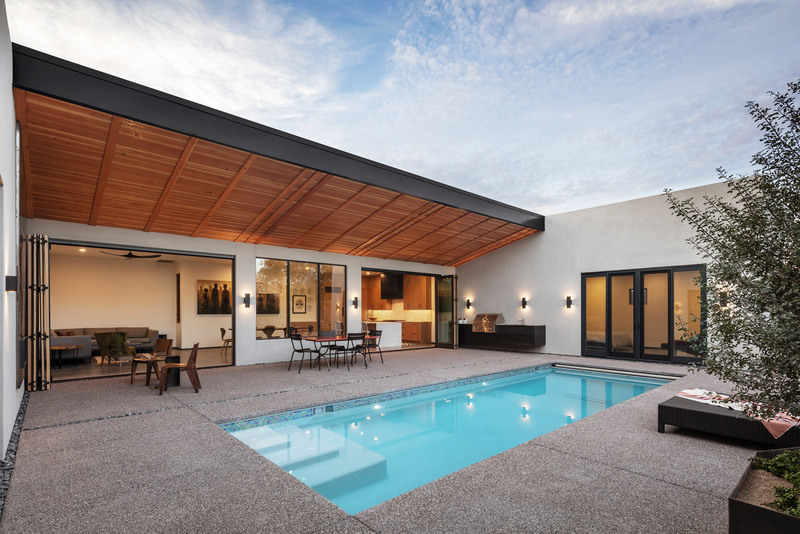 The firm has completed a number of projects in the Phoenix area, including the limestone-clad Red Rocks House and the Canal House, which takes cues from mission-style architecture. The firm also created the Uptown Row townhouse development that is wrapped in weathering steel, brick and light-toned stucco. Photography is by Roehner + Ryan. The post The Ranch Mine’s Weave house in Phoenix draws upon work by Georgia O’Keeffe appeared first on Dezeen.